Since coming to London I've been itching to explore Europe's hikes. But unlike many of the trails in the US it's been a bit more difficult in finding details about them online, so I'll try and do my part in bringing some of the information together. Here's a first stab with Norway's Preikestolen (Pulpit Rock). 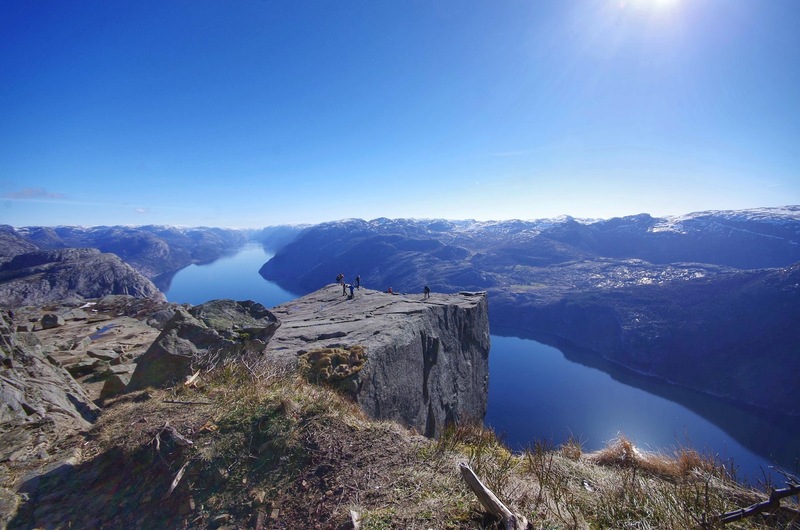 Formed 10,000 years ago by the physical fortitude of a glacier minding it's own business, Pulpit Rock is a 25x25m flat shelf located in Rogaland County. 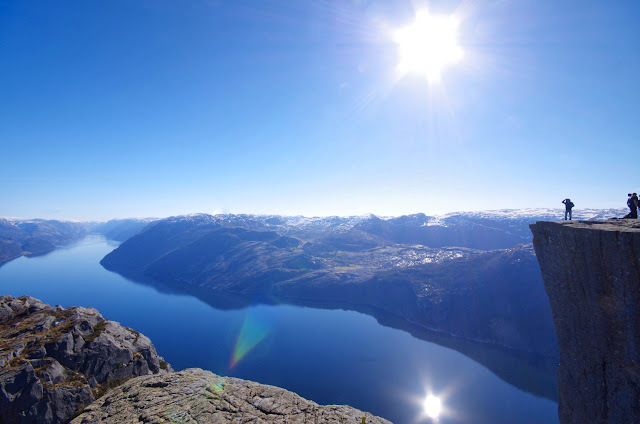 It stands just about 604m above the Lysefjorden. It's only roughly 3.8km from the trailhead to Pulpit Rock with a net vertical ascent of ~334m. This doesn't sound like much, but the trail ripples up and down quite a bit so it's slightly misleading to just look at the 334 number. Overall, it's a well marked trail (follow the red "T") and whether it's a tough hike depends on the weather conditions. There was still snow and ice in the latter part of the trail when I went. 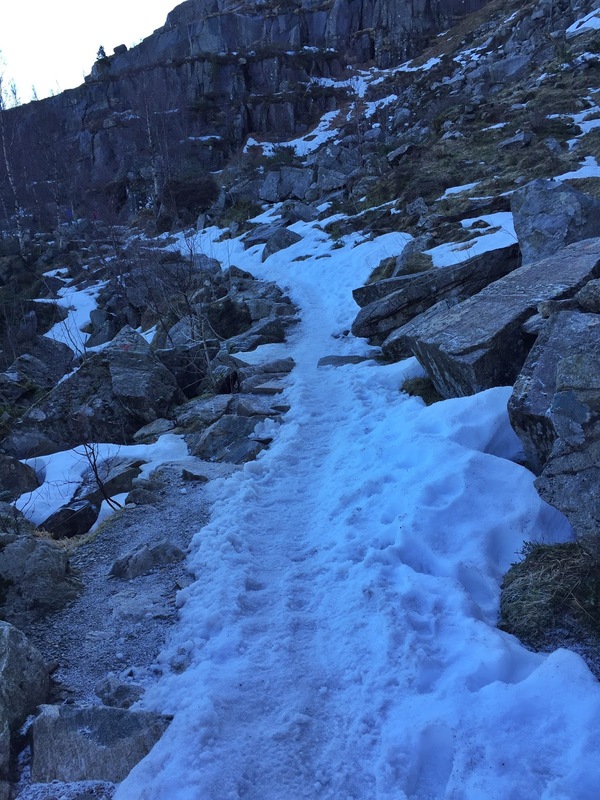 I'm not a big fan of hiking in snow and ice - mostly because I'm always thinking I'm going to slip and slide. And of course that's what happened. In total it was about 2 hours up and 2 hours down. See photos of my hike here. Early April 2016. I kicked off from the trailhead at 8:30, which meant fewer people at the top once I got there. There was a constant stream of hikers on their way as I was returning so I can only imagine how crowded it was later in the day. Temperature: Min -2.8°C Average 2.8°C Max 9.2°C. Clear blue skies, little wind. No precipitation. A short 80 minute flight from London to Stavanger. From the airport I took the flybussen to get into the city (180 NOK RT). The bust stop is just to the right of the exit. 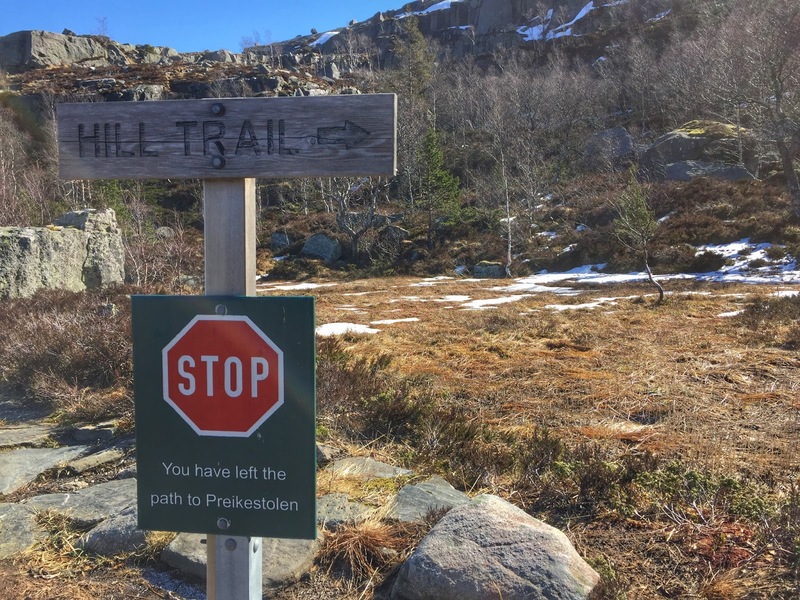 In Stavanger, I hopped on the 30 minute ferry to Tau (52 NOK one way) followed by a ~25 minute bus ride to the trail head (175 NOK RT). Both bus and ferry accept cash and credit card (sorry, no Amex). Remember: hike at your own risk as your safety is your responsibility.